and more than 150,000 readers love her books. Pediatrics at McGill University in Montreal, Canada. 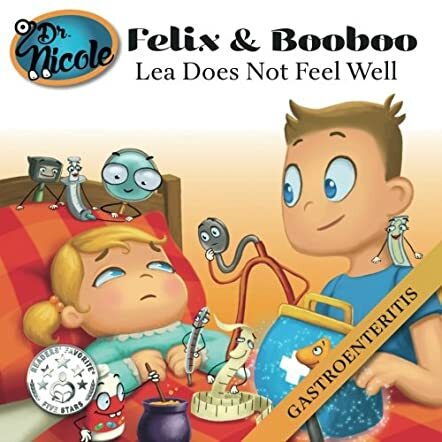 Lea Does Not Feel Well: Gastroenteritis by Dr Nicole Audet is another educational and informative book in the Felix & BooBoo series. The story opens with Lea calling Felix to say that she has diarrhea. She asks Felix to come to her place with BooBoo and his magical doctor’s bag. Lea is relieved when Felix and BooBoo reach her home. They tell her she has gastroenteritis and Pill offers Lea a spoonful of Pill’s potion. Felix tries to pacify Lea by telling his story of how he was in the hospital when he got gastroenteritis last Christmas. He tells Lea how he met BooBoo and his eight friends, and how they saved his life. The story tackles the topic of gastroenteritis and the author handles it methodically and extensively. She makes it a fun read with the help of Felix, BooBoo, Pic, Toc, Lens, Pill, View, Ahhh, Mr Long, and Hot. The illustrations are delightful and they bring the characters and scenes to life, thereby making it easy for young readers to comprehend all the symptoms of gastroenteritis in an interesting way. The quiz at the end of the book is helpful to readers to test their comprehension of what they have read. Dr. Nicole Audet’s Felix and BooBoo series is a must-have in all homes and school libraries as the author discusses falling sick and visiting the doctor in a fun way, and her characters in these books make the stories interactive for young readers. Visiting the doctor will not be the same again once these books are read out to children.